FR10: Grimaud. André Dimanche. Le Jeu de Marseille. Jeu de cartes surréaliste. 1983. Price: € 120.00. Unused deck in original box. 2 jokers, text card and folder. FR11: Luxor. No.1815. Price: € 1.00. Unused deck with golden corners. In box. 52 cards + score card. Joker missing. FR12: Vitrex. B.P.Grimaud. Price: € 8.00. Older deck with medical advertisement. Unused with original paper wrapper and in box. FR13b: B. P. Grimaud, Jeu Louis XV. No.150. Price: € 65.00. Delicate deck. 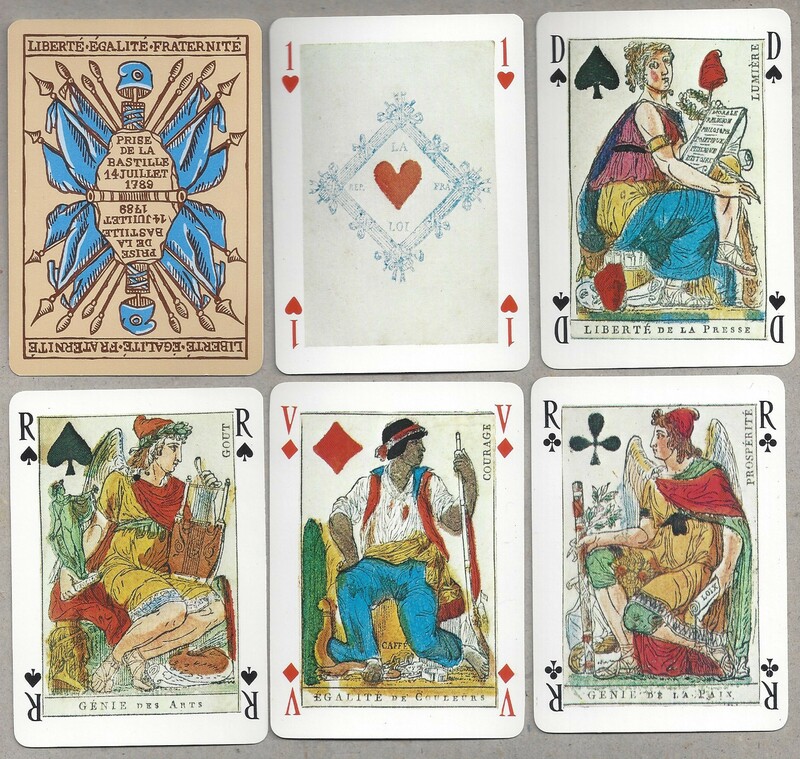 Originally published in 1890, but this deck was not sold in Denmark till 1918, – according to the green tax stamp on Ace of Diamonds, – and the price at the time was DKr.5,50!! Sligthly used deck, with nice golden edges. Used, but intact and with nice box. 52 cards, complete. FR13c: B. P. Grimaud. Jeu Louis XV. Post 1918. Price: € 40.00. Delicate deck. Sold in Denmark after 1918 (green tax stamp on Ace of Diamonds). Used/worn, but without bends or breaks. 52 + joker+ blank card. No box. FR14: Miniature deck. Price: € 30.00. 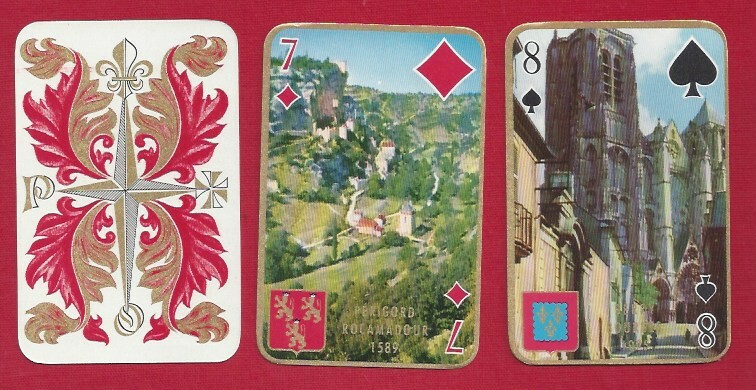 A similar deck is produced by Boman in Sweden around 1905, and by Dondiorf 1913-33. But .. possibly from France, or perhaps Belgium. BUT but, it could be Swedish. I have bought itin the USA, and on the box is written with an old pen “Ericson .. Kr.”, which might have been a Swedish immigrant?? Used deck, but in good condition. FR16: Cercles. Price: € 30.00. I have not been able to identify the producer CERCLES, but the deck is from after 1890, probably 1905. Stencil-coloured. Water mark on all cards. Older and worn, but quite nice. Six of Spades is missing. No box. French tax mark on Ace of Clubs. RESERVERET FR19: Philibert/Draeger. Le Florentin. Design P. Emile Bécat. 1955. Price: € 100.00. Unplayed but not mint. Golden corers. 52 + 2 jokers + 3 text cards. In a leather holster. FR20: Vitrex. B. P. Grimaud. 1983. Price: € 3.00. New unused cards in box. Two jokers. RESERVERET FR21: Cabourg. Price: € 1.00. Normal deck, produced in Hong Kong. Unused. Two jokers. In plast box. – RESERVERET Country Club. Price: € 1.00 Used deck in worn box without top and bottom. Two jokers. FR23: Grimaud. Versailles. Ca.1960. Price: € 10.00. Royalty on all court cards. Unused deck, 2 jokers + 2 text cards. In plast box. FR24a: Dusserre. Les Grand Rois de France. Price: 10.00. Unused deck in slightly used box. 52 + 2 +2 cards. FR24b: Dusserre. Jeu des Provinces de France. Price: € 8.00. Slightly used cards, in worn box. 52 + 2 +2 cards, complete. FR25: Les Gorges du Verdon. Price: € 2.00. It is said, that if you haven’t seen this, then you have missed something worth seeing! Unused cards in box. 52 + 2 cards, with photos on all cards. RESERVERET FR26: Les Editions du Lézard. Scopa. Jeu Traditionnel Corse. Price: € 7.00. Unused deck, 36 + 4 title cards. Leaflet with rules. No box. FR27: Delluc Cartier. Corsaires & Flibustiers. 1958. Price: € 60.00. Unused deck with golden corners, in slightly worn box. Complete with 52 + 2 jokers + textcard + blank. FR28: Grimaud. Price: € 1.00. 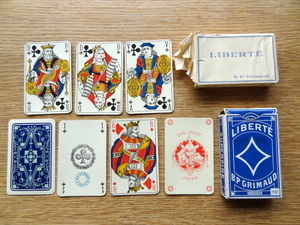 A deck as they come from France, with names in the corners. An ordinary deck, but still slightly different, at least the reverse is new for me. Worn cards in plastic box. FR29: Heron. Catalanes. Ca.1960. Price: € 15.00. Unused deck in special box. 48 cards, complete. FR30: Catel & Farcy, Paris. Napoleon. 1960. Price: € 25.00. Unused deck in plast box with a relief of Napoleon. 52 + 2 jokers + 2 cards. FR32: Ancien Tarot. Tarot Chine. Seamonster Tarot. Grimaud. Ca.1880. Price: € 200.00. Beloved child has many names. Rare and famous deck. Very dirty and worn, but without breaks and bends. 78 cards, complete, no box. FR33: Liberté. B. P. Grimaud. Price: € 15.00. Probably published just after WW2. The reverse is somewhat Art Deco. Sold from Papeterie Jouffroy in Passage Jouffroy, which still is an intersting location in i Paris. The deck has been viewed over the years, so the box is slightly worn. The paper wrapping has been opened. The cards have nice silvery corners. Two jokers and a blank. FR34: Affiches Retro. Grimaud. 1991. Price: € 15.00. Wonderful posters from a past era, and with sicknesses of the past! Really kitsch. Unused cards in box. FR36: Dieudonné, & Cie, Angers-Paris. Ca.1930. Price: e 5.00. Worn deck. Three of Diamonds and four of Spades miss a corner. No box. FR37: Carta Mundi. Imperial. Price: € 5.00. 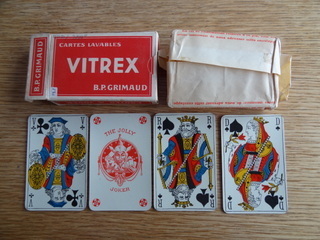 Double deck in original box and cardboard holder. 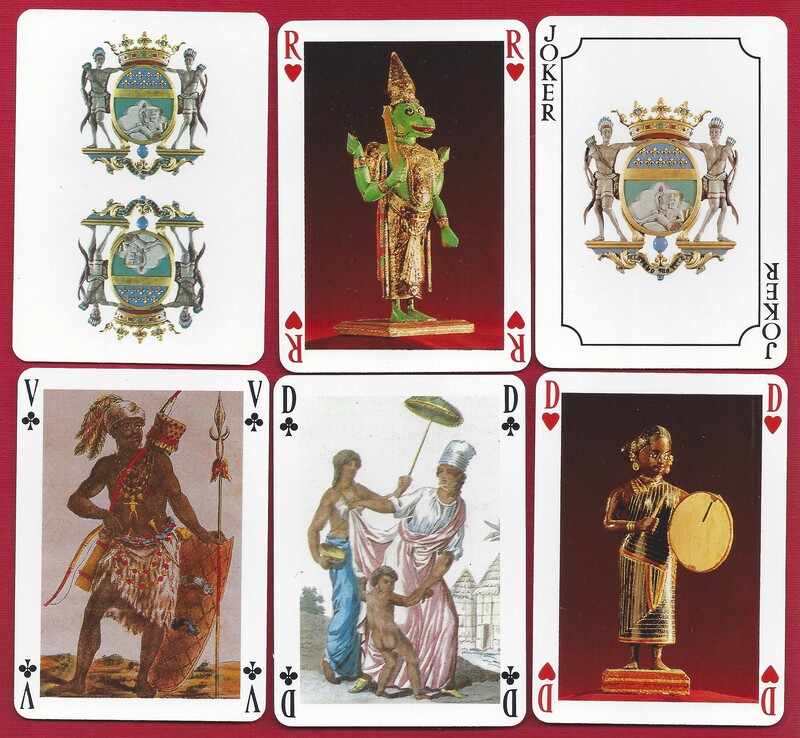 Beautiful, unused cards with the Napoleon emblema on the reverse. FR38: B. P. Grimaud. Ca.1900. Price: € 10.00. Only 51 cards, 6 of Hearts is missing, no box. Much faded and yellowed, unevenly, but still with golden corners, and without breaks. FR39: Grimaud. French Line. Cie Transatlantique. 1961. Price: € 30.00. Unused deck. Two jokers. No box. Golden corners. FR40: Transformationskort. 1976. Price: € 20.00. 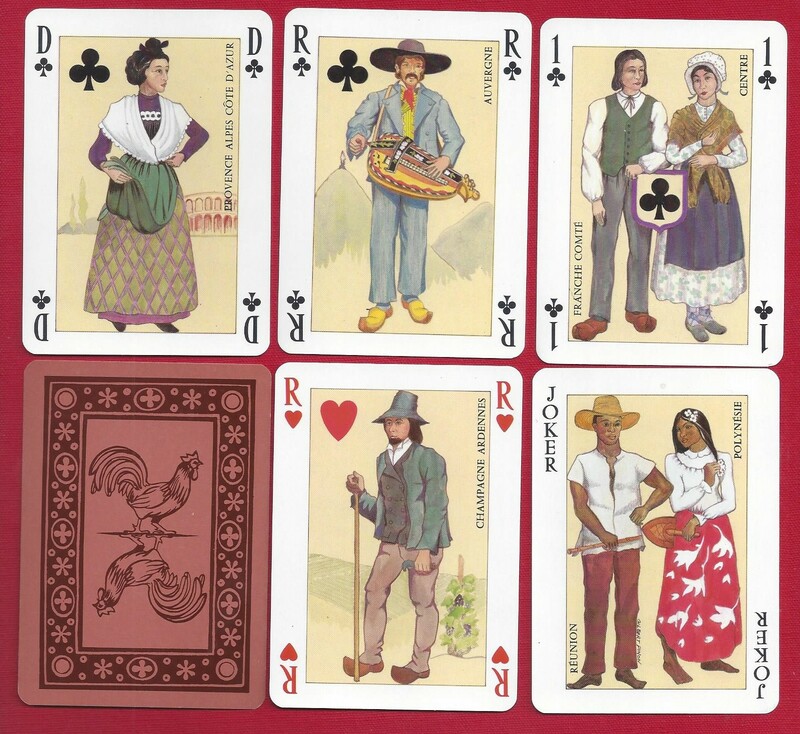 This deck was reproduced by the Danish National Museum in 1976, as a reproduction of a French deck from the middle of the 19th century. In each card another picture is encapsulated. 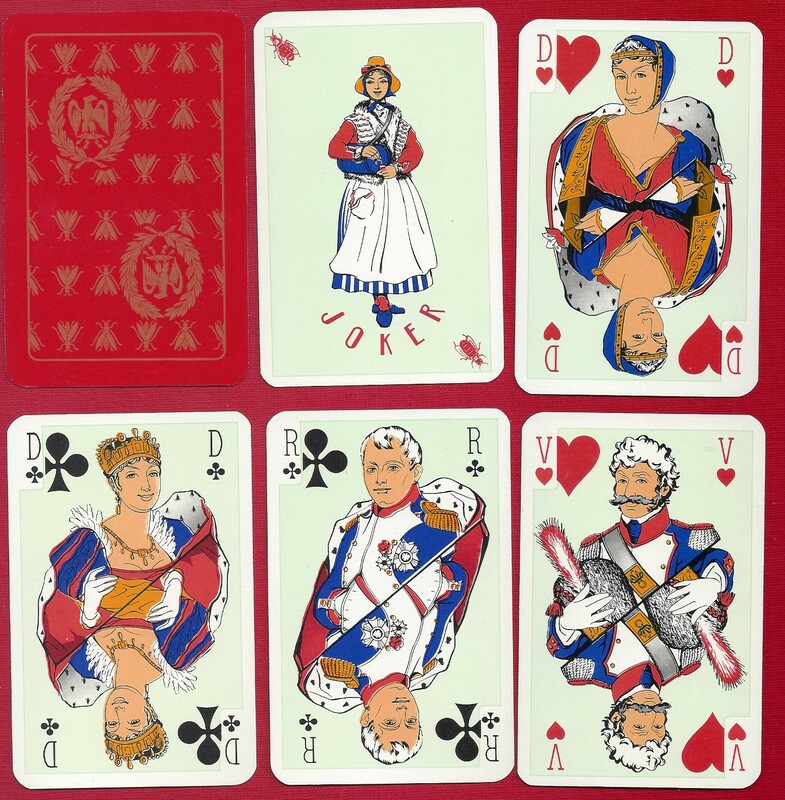 The court cards in particular ar special and dramatic. The lady is said to be Joan of Arc, but it’s not true. Now, after 40 years this reproduction is somewhat rare. Unused cards in original box. FR41: Grimaud. 1915. Price: € 20.00. Two decks. Stencil-coloured. Seem unplayed, but of course “oldish”. No box. FR42: Jeu du Musee de la Compagnie des Indes. Ca.1986. Price: € 5.00. Unused cards in box. Items from the museum on all court cards. FR43: Mandragora. R. Moretti & Ch. Pasino. 1984. Price: € 60.00. Stencil-printed deck. 52 + 2 cards + sheet, in original wrapper, unused. Deck no.75 of only 300. Signed by the artist. FR44: Ca.1900. Price: €15.00. Unknown producer. 32 cards, complete, no box. Faded and yellowed but not worn. FR45: Grimaud. Les Géants d’un Mythe. 1983. Price: € 15.00. Unused deck in box. 52 + 2 jokers + namelist. FR46: La Ducale. Cartes Catalanes dos Écossais “Axe”. Price: € 1.00. 48 cards, complete, in box, unused. FR48: Frans I. Dusserre. Price: € 5.00. Unused cards in slightly worn box. 52 + 4 cards + text card. FR49: Grand Prix Grimaud. 1973. Price: € 25.00. 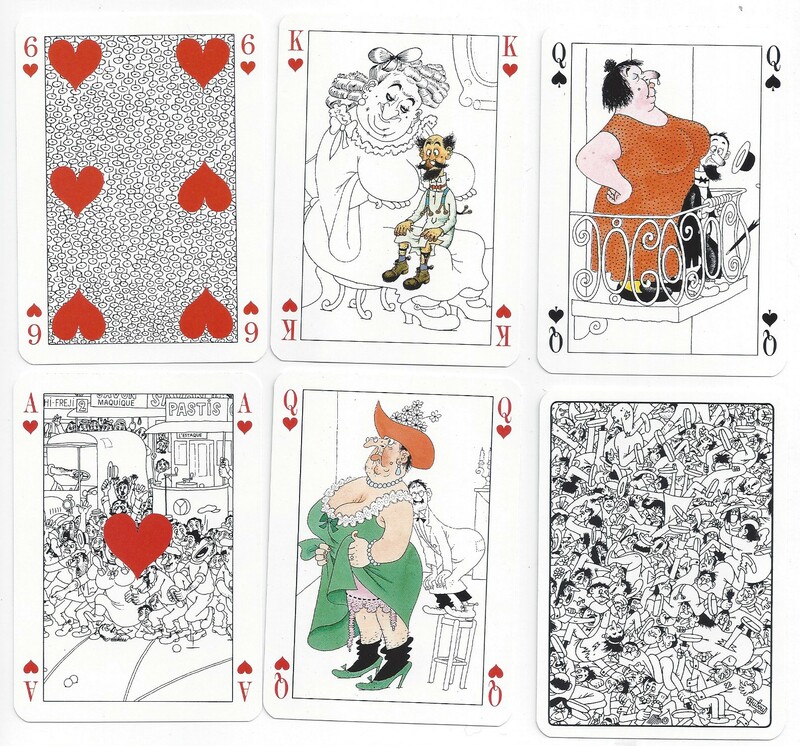 The firm Grimaud had a competition about designing a new deck of cards. This deck won. Design by Geneviève Lirola. Unused cards in original box. 52 + 2 +1 cards. FR50: Catel & Farcy, Paris. Ca.1910. Price: € 5.00. Incomplete deck. Only 32 + 1 blank card. 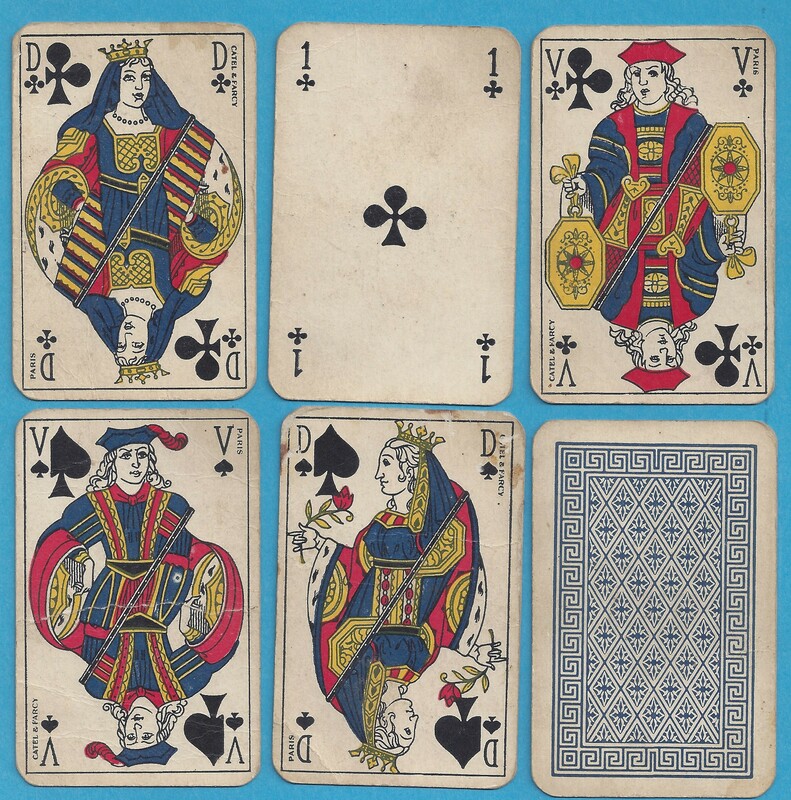 Of the court cards missing are Ace and Jack of Hearts, King of Clubs, plus Ace and Jack of Diamonds. Worn, torn and dirty cards. FR51: Jeu des Copains. Les Vedettes de la Chanson. 1964. Price: € 5.00. With pictures of singers on all court cards. 52 cards + 1 joker + card with names of the singers. Used, in box. FR53: Draeger-Frères. Hermes. Cassandre. 1948. Price: € 80.00. Used deck, with no bends or breaks, with fine golden edges. Little worn box missing the to side flaps. 52 + joker + text card, complete. FR54: Normandie 1944-1994. Design: Yannick Pennanguer. Price: € 6.00. Printed at the 50th anniversary of the Invasion. 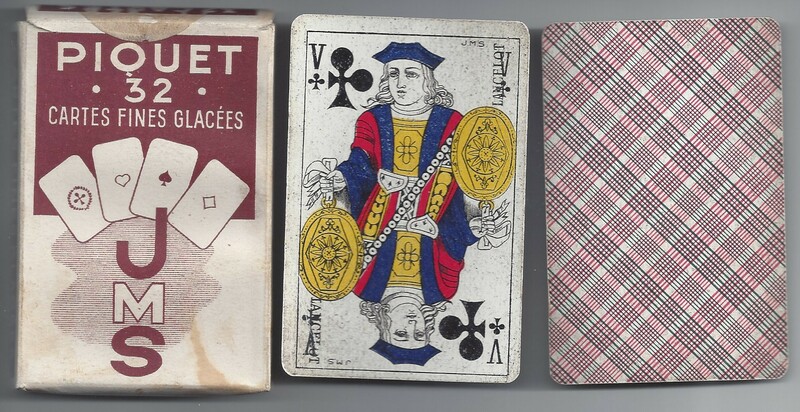 Unused deck in box, 2 jokers and a French textcard. FR55: Grimaud. La Carte toilée. Price: € 1.00. Very very dirty cards, in defect box, 1 joker. FR56: JMS. Piquet. Price: € 2.00. Very used and dirty deck, in box, 32 cards complete. FR58: Jeu Dubout. Grimaud. 1987. Price: € 15.00. Joyful drawings by the artist Albert Dubout. 52 + 2 + 1 cards. Unused, in box. FR59: Philibert. France Souvenirs. Price: € 25. unused or very slightly used. 52 + 2 jokers + text card. In original plast box. Photos on all cards. RESERVERET FR60:Grimaud. Jeu Mythologique. 1983. Price: € 30.00. 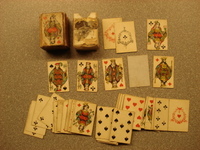 Unused deck, reprint of 1848. Reprinted with 12 colours. Delightful. 52 cards + text card + original box. FR62: JAZZ, Grimaud. 1989. Price: € 10.00. Unused deck in box, 52 + 2 +1 cards. FR63: Le Giscarte. Arts et lettres. 1976. Price: € 30.00. 2000 years of French historie depicted through caricatures of one man, – on all cards: Valery Giscard d’Estaing. RESERVERET FR64: Grimaud, Paris. Rilsan (MONOFIL-TECHNIK GmbH). Price: € 4.00. Double deck in original special plast box. Unused. FR67: L. David, Paris. 1892. Price: € 25.00. Fortune-telling deck. Ordinary cardboard with no design on the back. 30 cards of 32. Supplemented with photocopies of the two missing cards + a copy from a similar deck with information on the printer. No box. FR68: Les Mousquetaires. Philibert. Design: Dubout. 1954. Price: € 80.00. Unused deck with golden edges, no box, 52 + 2 jokers + title-card. FR70: Revolutionary deck. Dusserre. Repr.1977. Price: € 4.00. 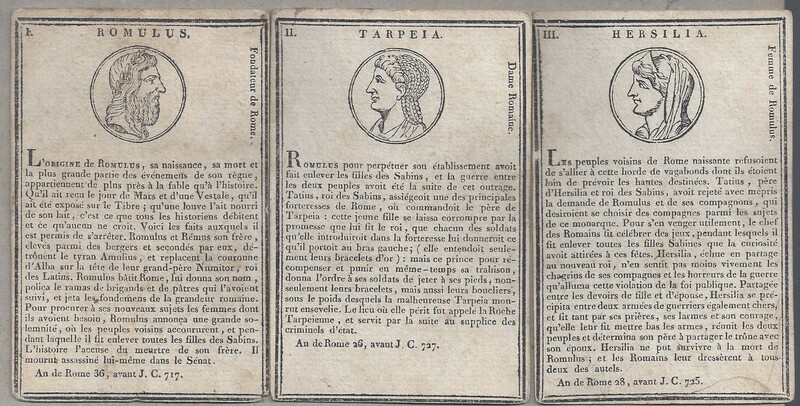 Reprint of a deck from 1793. 52 + 2 cards, in box, unused. FR73: Miro Company. Ciel de France. Ca. 1950. Price: € 30.00. Unused deck,52 + 2, in original box, slightly faded.